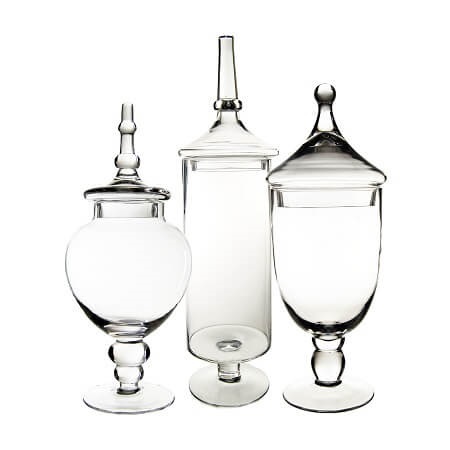 Tall Glass Apothecary Jars in a set of 3 really stands out on your candy store countertops. Tall and stylish each candy jar all standing over a foot tall draw the eye. Arrange beautiful centerpieces for events as well as your dining room table at home. Use the entire set in one arrangement on round tables or spread them out down longer tables. 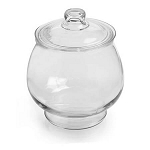 Weighted bases give the glass candy jars stability for any place you choose to place them. Candy buffets are an important part of weddings, anniversary parties, birthday parties, baby and bridal showers and other celebrations. Now you can be sure to have a buffet that will be the star of the show. Fill each tall glass candy jar with candy which matches the color or the theme of the day. If you really want to take it up a notch, spread the theme through the centerpieces and buffet. Have a beach theme? Fill candy buffet containers with chocolate seashells, as well as placing real shells into the tall jars for your tables. When you start with a pretty container, you are sure to end up with an outstanding display. 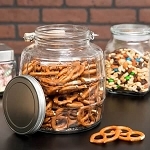 Be sure to order these jars for candy buffets today! Height: 16.5" Opening: 5.75" Body Width: 6.5" Base: 5" Thickness: 1/8"
Height: 14.75" Opening: 3.5" Base: 5" Thickness: 1/8"
Height: 22" Opening: 5" Base: 5.5" Thickness: 1/8"